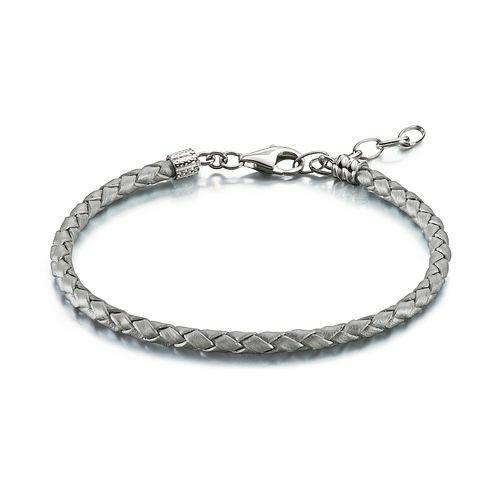 Crafted with braided silver coloured leather, go for a laidback look with this stylish bracelet, ready to add your favourite charms to, or simply wear alone. Discover all the ways to express yourself with one of a kind jewellery that reflects your life and experience. Inspired by your personal sense of style, Chamilia jewellery is as unique as you are. Chamilia Silver Metallic Braided Leather Bracelet is rated 5.0 out of 5 by 9. Rated 5 out of 5 by Anonymous from Elegant and modern Lovely bracelet for my younger grandchildren. Came in beautiful packaging. A perfect gift and a perfect time price.